Monthly face-to-face meeting, with short video or phone call check-in mid-month. Bi-weekly face-to-face meetings, with short video or phone call check-in on off weeks. Weekly face-to-face meetings, with daily connection through Slack, Messaging, or Email. So often, business people get so caught up working IN their business - finding the next client, delivering awesome service, producing the product etc. Unfortunately, it usually means they don’t consistently and effectively take the time to work ON their business - building systems and processes, evaluating strategic alternatives, clarifying roles & responsibilities, planning for capturing growth opportunities, etc. Also, most business people don’t get into business because they can’t wait to run a business, manage people, network & promote their business, pay bills, etc. They go into business to pursue their passion, to leverage their special talent, to work on their own terms. 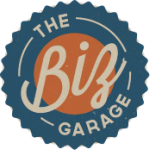 The Biz Garage wants to help you and your business stay focused on doing what it is YOU do best, to allow you to apply your energies and passion to growing the business. We will help you get clear, get focused, keep you accountable, and learn how to build a business to support your passion and skillset.